An article published in the National Library of Medicine National Institute of Health last year showed that the results of a human clinical for the treatment of patients with mild to moderate Ulcerative Colitis. Patients were given VSL#3 for 6 weeks. At the end of the 6 week period those patients had a remission rate of 77% with no adverse side effects. 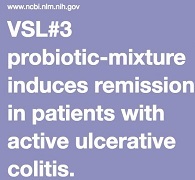 How Does VSL#3 Probiotic Work? Many probiotic formulas contain beneficial bacteria, but due to differences in types of bacteria and preparation of the products, these bacteria die off from varying conditions throughout the GI tract and never make it to the place they need to be. 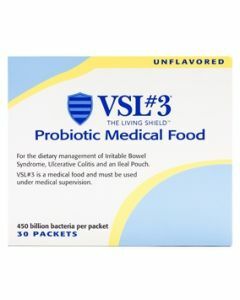 Studies shows that probiotics from VSL#3 do make it to the colon, which is the area they need to reach to be effective. A study conducted with VSL#3 confirms that maximum bacterial colonization of the gut occurs within 20 days. It’s not really one of those things where you can just take it for a few weeks and think you are good to go. You are essentially adding new bacteria to your gut to recolonize it. 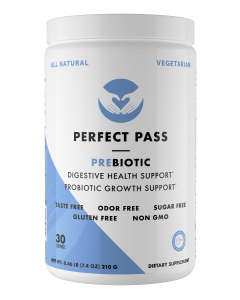 We find most of our clients have the greatest success when pairing VSL#3 with a prebiotic fiber containing partially hydrolyzed guar gum to help feed the probiotics so they grow and multiply in numbers. Another study conducted on children with Ulcerative Colitis also showed promising results. One 4 week study, conducted on children with UC, found that after the 4 week period where treatment included steroid therapy along with either VSL#3 or placebo, 92.8% in the VSL#3 group achieved remission, compared with only 36.4% in the placebo group. To maintain the remission, the researchers gave the children 5-ASA along with either VSL#3 or placebo. They then monitored the children over the next 12 months, and found that 73.3% of those who had 5-ASA and placebo experienced a relapse, compared with only 21.4% of those who were taking 5-ASA and VSL#3. This study also reported no adverse side effects from VSL#3.